Writing a novel takes a lot of skills. You have to create characters the reader cares about and a fantastic plot full of conflict. Then you must get a lot of other elements right such as pacing, setting, and dialogue. You probably have to research some aspects of your story. And you’ve got to make sure your grammar and punctuation don’t yank the reader out of the world you’re creating. But there isn’t one right way to do it. As I’ve studied the craft of writing and talked to other writers about their methods, I’ve been struck by how different the process can be for each of us. And I’ve come to the conclusion that the differences often have to do with left brain/right brain issues. The left side of your brain is the logical side. (A good way to remember this is that they both begin with the letter “L.”) The right side is the more intuitive side. All of us do use both sides of our brains. But how we approach the writing process has to do with which side is dominant. For me, it’s the logical, left brain side, which means that I want to outline my books before I write them. I want a clear roadmap of where I’m going. Writers who plunge in and start writing are more right brained. But even when they haven’t worked out the whole plot before they begin, at some point they must figure out the incidents of the story in order to complete the project. Each of your own books should start with something that fascinates you. Perhaps it’s a character whose story you are burning to tell. Or maybe it’s a brilliant plot twist. Or perhaps it’s an issue ripped from the headlines–like a man plotting mass murder in a movie theater or the governor of a state willing to do anything for money. For me, a book usually begins with what I think of as a “cool idea.” It can be a character, a plot point or a combination of the two. Take one of my Decorah Security books, Dark Moon. What if a rich man’s daughter is kidnapped and taken to a slave ship? And what if the only person who can find her is a werewolf? For my Harlequin Intrigue, More than a Man, I was thinking about a man who had lived for more than 500 years. What would his life be like? What problems would he encounter that would be totally unique? Would he be afraid to love because he knew that he’d always lose his partner? In Her Baby’s Father, another Harlequin Intrigue coming out this month, I started with the idea of a woman whose lover was murdered, leaving her pregnant. As the book begins, she’s in labor and driving herself to the hospital in a snowstorm. When her car crashes, she knows she’s going to die. But angels send her back in time to the day she met the man she loved, and she’s given a second chance to keep him from being murdered. Can she convince him he’s in danger without making him think she’s crazy because of her odd behavior? It’s important to remember that the story you are writing is not reality. It’s a world you create. But you must make it look, sound, feel, taste and smell real to the reader. You do that by paying attention to every detail from characters and plot to setting and dialogue. Yet some details are more important than others. I’m sure you’ve had the experience of picking up a book and starting to read–then giving up after a few pages or a few chapters. Why? Probably because you didn’t like the plot or you couldn’t connect with the characters. Choosing a subject for your book should be the most right brain part of your whole process. You must love the idea of your story. It must turn you on. It must be an idea that you are dying to write. If it isn’t, you’re not going to do a good job. In other words, there’s no use picking an idea because it’s “In.” You see cowboy books are in, so you decide to write one. Only you don’t know a darn thing about ranches, and you hate horses. Trying to write a ranch book would be like jumping into a pit of alligators. Instead, think about the topics that work for you. Ironically, the idea doesn’t have to be your own. A few years ago I was working on a proposal for a multi-book contract, and the editor had rejected my third synopsis. We had to come up with an alternative, and I asked her if she had any ideas. That was the beginning of Amanda’s Child, one of my own favorite Harlequin Intrigues. From that idea, I built a whole story. When you think of a story you want to write, do you come up with the plot first or the characters or a cool idea? And do you plunge in or work on an outline before you start to write? One person who comments can win a CD copy of my Carina Press novella, Dark Magic. But please, if you want to be eligible for a book, include an e-mail address or your Twitter handle so I can contact you easily. 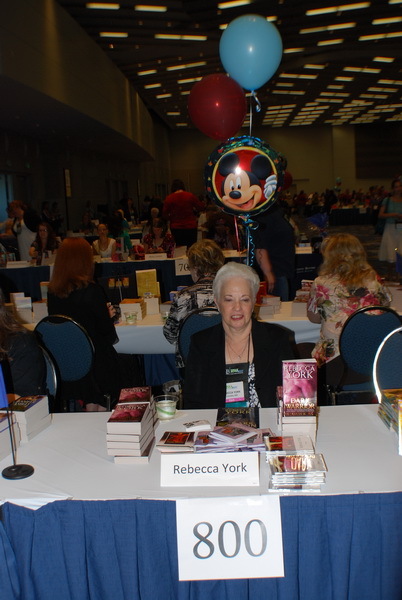 If you’d prefer not to make your e-mail address public, send it to rebecca@rebeccayork.com with Subject: “How Do You Get There from Here?” Blog.